This soup will give you approximately 8 1.25 cup portions or 55-60 smaller portions if you serve them as chai glass shots to a large crowd. The Chai glasses in the photo hold about 40-45 ml but you can find bigger chai glasses also. This is a rich soup and quite filling when served as a full size portion. Its also good with garlic baguette toasts or spiced pecans. Heat a large pot of water. When boiling add sweet potatoes. Cook until tender about 10 minutes.Drain. Reserve 3 whole sweet potatoes. Peel remaining sweet potatoes and chop coarsely. Cover and reserve. Melt butter in a large pot on medium heat and saute onions, garlic, celery until soft about 2 minutes. Stir to prevent excess browning. Add carrots, apples and sweet potatoes and cook another 2 minutes, stirring to prevent burning. Add cayenne, allspice or nutmeg, 2 teaspoons salt, white wine and stock and cook 8-10 minutes on high heat. Cool soup. Taste soup for seasoning and adjust. Puree soup in batches until smooth. 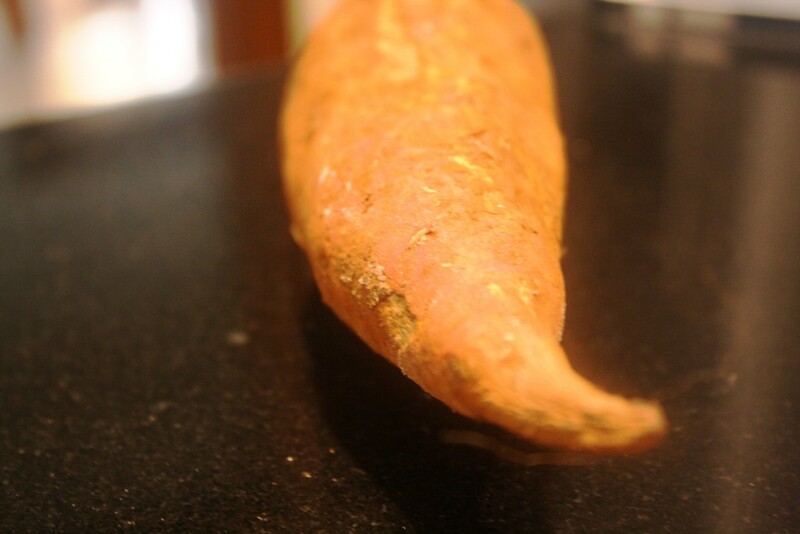 Just before you are ready to serve the soup peel remaining sweet potatoes, slice in wedges. If you plan to serve them in chai glasses the wedges should be thinner and longer. If you want to serve full size portions in a mug or soup bowl cut the sweet potato into small cubes. Deep fry in 2 inches of hot oil until crisp. Drain and toss with a little salt, allspice and cayenne. Reheat soup on a slow flame, stir in cream or soy milk and pour into bowls, glasses, mugs or cups of your choice. Garnish with a wedge or cubes of fried sweet potato. 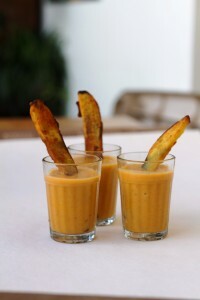 Just before you are ready to serve the soup peel remaining sweet potatoes, slice in wedges and deep fry until crisp. Toss with a little salt, allspice and cayenne. Heat soup, stir in cream and pour into bowls or cups of your choice. Garnish with a wedge of fried sweet potato. In Karwar about 2 hours drive from Goa, raw chopped onions are often added as a garnish to chutneys and vegetables. If you prefer not to garnish with onions you could consider cilantro or coriander leaves, toasted and crushed peanuts or nothing at all. This dish requires a starchy vegetable. Butternut squash, red pumpkin, sweet potato, yam (avoid gummy ones) or Calabasa. If you want something with less sugar and starch you could also use carrots. Consult your doctor if you have health restrictions before enjoying this recipe. Wash thoroughly then cut the green onion stalks and separate from the bulbs. Finely dice the bulbs and reserve. Slice the green stalks and their white tips in fine rings and reserve. Heat oil in a large skillet or kadai. Add cumin seeds and torn curry leaves and sauté 1 minute until fragrant. Add diced bulbs and sauté 1-2 minutes. Add garlic and ginger paste and sauté again until fragrant. Add chopped sweet potato or red pumpkin, turmeric and cayenne pepper and stir well about one minute on a medium flame. Add one cup water or half cup water and half cup coconut milk, tamarind and 1/2 teaspoon salt. Cook until tender and edible. If water evaporates before pumpkin or sweet potato is cooked add a little more. Taste for sweet, spicy and salt and adjust cayenne pepper and tamarind accordingly. 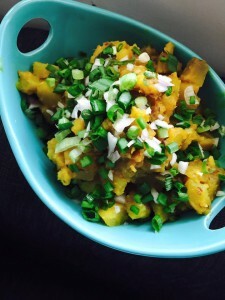 Top with raw green onions and serve warm with Bhakris or flatbreads of your choice. 1. Combine mawa, condensed milk and almond flour in a mixing bowl. Using your fingertips, form a soft and pliable dough. Add more almond flour if it’s too sticky and more condensed milk if it’s too dry. 2. Divide into 12 portions. Wipe your hands clean and roll each piece into a ball. Bury a pistachio half in the middle of each ball. Roll again until smooth. 3. Place half inch apart in a plastic freezer safe container lined with parchment. Freeze for an hour until firm. 4. 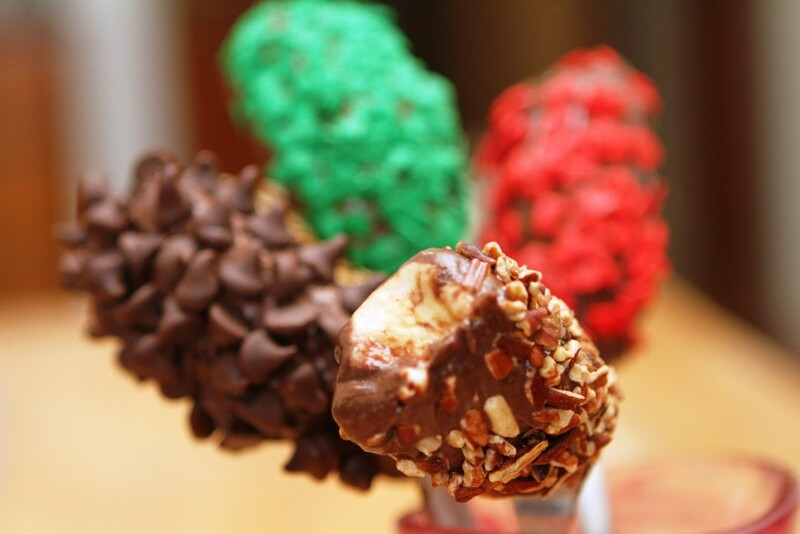 Melt chocolate and oil in a milk pot or double boiler on a low flame. If you have a thermometer do not let the temperature rise over 110 F.
5. Take chocolate off the fire and stir in condensed milk and the cocoa. Keep stirring to remove all lumps. Reduce temperature to 80 F or until its cool but still liquid. Strain into a small bowl about 2-3 inches wide and 3-4 inches deep. 6. 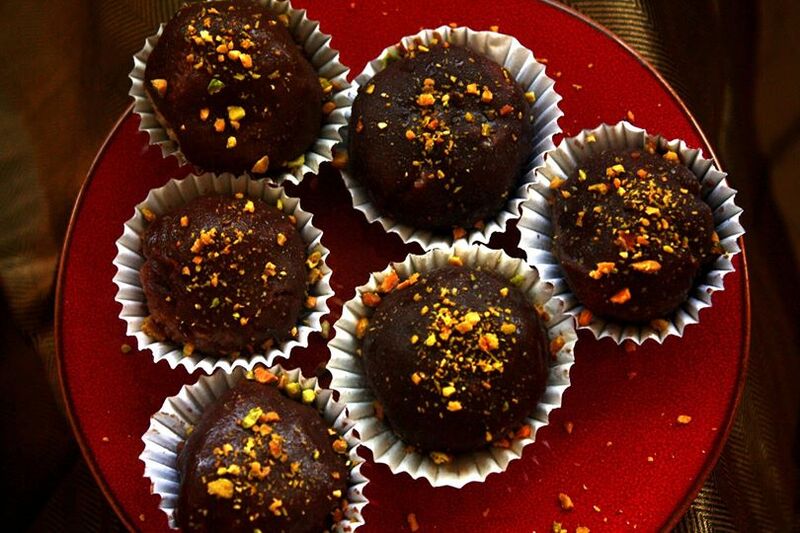 Using a toothpick dip each ball of chilled mawa into the cooled chocolate to coat completely. Hold it up over the bowl to let excess chocolate drip away. Place each ladoo in a small cupcake or truffle wrapper and extract toothpick. Brush with a little chocolate to disguise the hole. Sprinkle with decoration of your choice. Cover and refrigerate overnight. Serve chilled. Consult your doctor if you have allergies or health restrictions before trying this recipe. 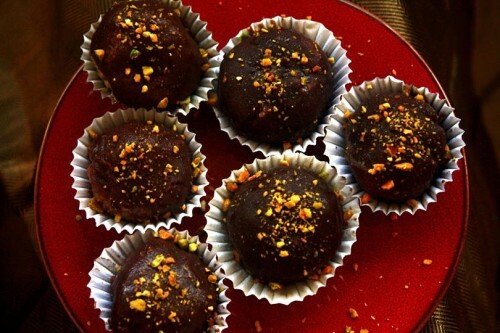 You can make this a vegan dessert by using milk free chocolate. If you have nut allergies use coconut flakes instead. Toasted white sesame seeds, crushed M and M's, dried fruit are some of the optional coatings for this delicious recipe. Consult your doctor if you have allergies or health restrictions before enjoying this recipe. Peel the bananas, slice them in half horizontally. Use plastic forks or dulled bamboo skewers to pierce the banana halves. Slide the skewer or fork in until it holds the banana firmly. be careful not to split the fruit. Place these popsicles in a freezer safe plastic bag, 3-4 per bag and freeze overnight or for a few hours until the bananas are frozen. Prepare your work area. You will need a clean surface area, 2 medium plates or food safe trays, a clean dish cloth, several teaspoons and small bowls or cups filled with your sprinkles. You will also need 3-4 tall and heavy glasses to hold the prepared popsicles. Arrange these glasses in one of the plates or trays. Melt the semi sweet chocolate and oil in a small but deep saucepan about 4-5 inches deep on a slow flame stirring regularly.Once the chocolate is almost melted turn off the flame and continue stirring until the mixture is smooth. Let cool 10 minutes. Remove frozen popsicles from the fridge and dip each frozen banana popsicle into the warm chocolate. Hold it lengthwise, the fork handle facing upwards over the saucepan to let excess chocolate drip back into the saucepan. Working quickly, hold the popsicle over the empty plate and sprinkle with topping of your choice. 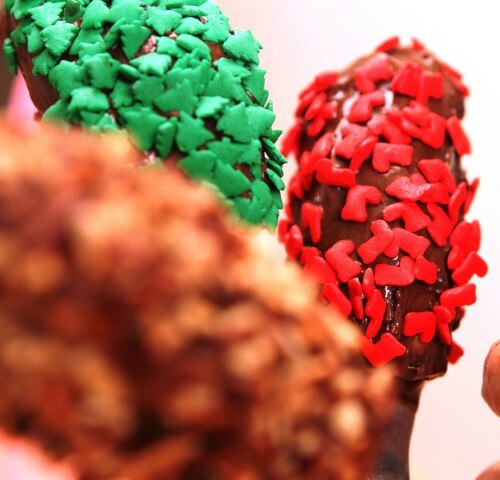 Use the nuts, chips, morsels and sprinkles of your choice-you can use one sprinkle or many. Turn the popsicle as you spoon the coating over the banana. 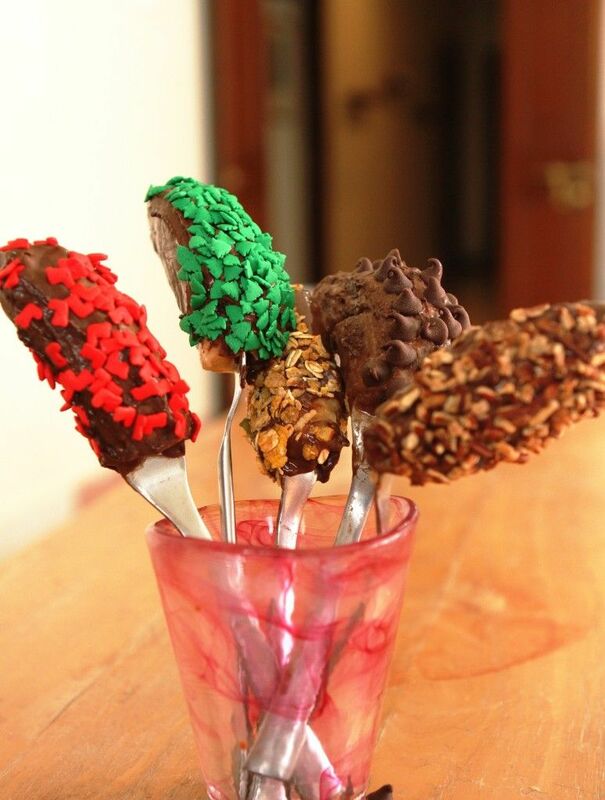 Place popsicle in a tall glass that can hold the exposed length of the fork or skewer. When you've completed 3-4 popsicles place the glass back in the fridge. if its still dripping put the glass in a small plate. Repeat with remaining popsicles. Allow the chocolate to set 6-8 hours. Serve cold and eat immediately after removing from the fridge.